On a sunny afternoon in 2010 I went to Wolfgang Tillmans’ photography exhibition at Serpentine Gallery in London. Afterwards, as I walked through Hyde Park, it seemed as if his photographs had recalibrated my optic nerves – the colours and geometry of the park jostled with a new urgency to be noticed, to be photographed. Look – the edge of the rubbish bin against the dry grass, there under the trees, the Japanese tourists. An epiphany! My reconfigured vision gradually settled, but over the following weeks I had the odd moment of déjà vu – a bush growing up the side of a block of flats, a child in a baby-seat in the front of a car, a man talking on the phone on the deck of a ferryboat – I had seen them all before in a Tillmans’ photograph. 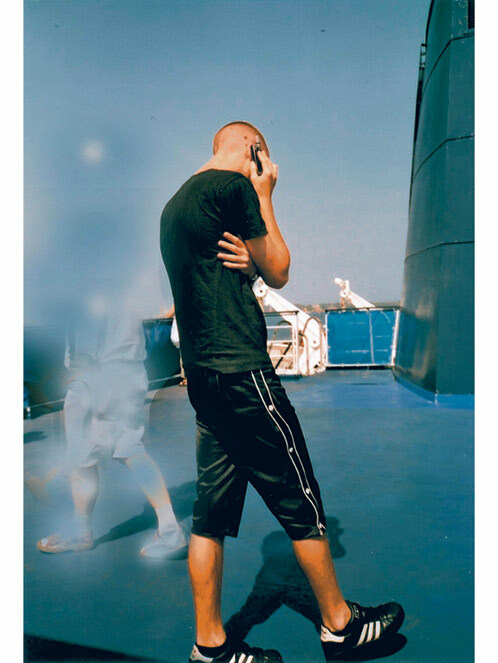 In Gedser (2004) a man stands on the deck of a ferryboat, wrapped in a mobile phone conversation, behind him the remains of another figure, badly photoshopped. Tillmans shows us what photographs (objects with a surface) can do, how they slip between truth and untruth. But while erasing people from photographs has been a standard tool for those rewriting history, maybe here it just looked better without the other figure. How we see the world shapes what we think is important and Tillman’s attention to the everyday reminds us of events and places from our own lives, encouraging a broader vision, inclusive and accepting. It is that quality of being attentive, Tillmans suggests, which determines how we then act in the world, and by extrapolation, how society as a whole acts. His work subtly reclaims photography’s role in reflecting and creating the world, inviting us in, to both see, and create for ourselves. Tillmans’ Gedser was taken near the Danish, Baltic Sea port, while my déjà vu moment came on a boat leaving Swansea. Next time you find yourself on a ferry, step up onto the passenger deck and take a look. In 2015 Wolfgang Tillmans was awarded the Hasselblad Foundation International Award in Photography.